New Smyrna Beach Brewing Co.
"This is the dream. Brewing beer. For years, Chris Coyle was brewing beer at home for friends and family. In 2013 he stepped out of the garage to open his own brewery and taproom. 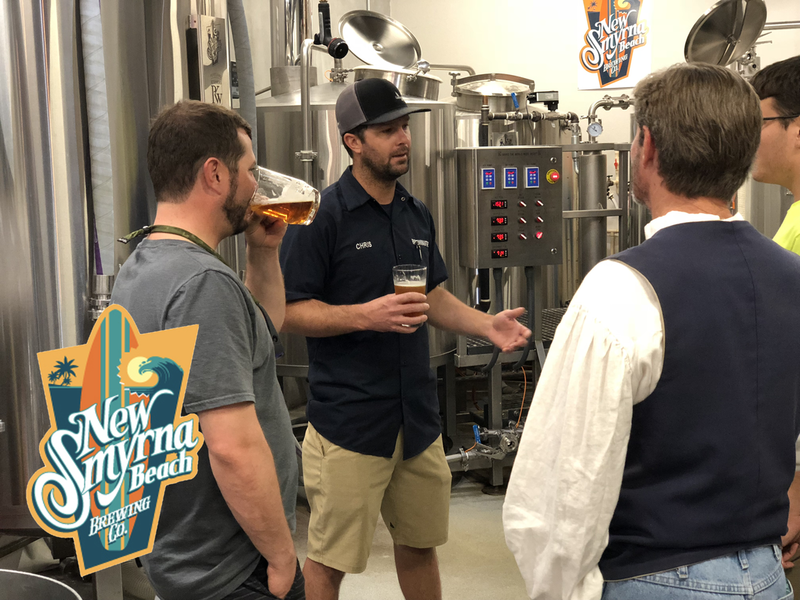 With no experience in business, no experience running a bar, and no experience brewing beer on a larger scale, Chris and his wife sold off what they could and got to work opening the New Smyrna Beach Brewing Company. What they didn’t know is that a Federal Government shutdown would keep them closed with no money coming in for two months. Chris Coyle (CC): My wife and I, we brewed beer specifically for two of our friends to do the happy hour at their weddings. And we were serving that beer to their guests and we got a lot of positive feedback; people were asking us, you know, what brewery is this from, questions like that. And we said oh no this is a gift that we brewed in our garage for the bride of groom. And we got a lot of positive feedback from people that didn't know who we were. And so that kind of sparked the thing of, holy crap, you know, people actually that this is really good beer. They don't know who we are; they're not just trying to make us feel good. This is like, legitimate testing of, or sampling of, our product to a pretty broad audience. A lot of people are typically into your very light lagers and stuff like that, so here they are drinking a red ale or a hoppy IPA or something like that. Glen Sanders (GS): Yeah, what did you make them? CC: So one of my friends' last name is Porter, so we did a porter-style beer, so have a really nice dark beer. And then we did a light America-style ale, and then we had an IPA. And we also had a golden apricot ale and I don't know what two of the other ones were. GS: So the feedback at the wedding was great? GS: So wait, what was the fun stuff you had to sell off? CC: Oh gosh, a lot of surfboards, some wake boards. A lot of surfboards. Just a totally different mentality on spending. A lot of house projects got put on hold, a lot of renovations. You know, I don't really remember anything that broke my heart to get rid off, because we had that goal in mind of starting a brewery. So the excitement was there for something new. So a lot of old stuff, it wasn't hard to get rid off. CC: But yeah, so we started to figure out, do some research. I think this was late 2011 or early 2012. Started putting together a quasi business plan. Meantime, my wife's going to school full-time; I'm working full-time. Trying to do all of this between commuting for work and she's commuting to school. CC: So it kind of came together early 2013. We had been scouting for a location and came across the spot that we started in, which was 112 Sams Avenue, which is right around the corner from us. It was a 900-square-foot location. Met with the landlord, and here we show up, my wife and I, I'm in flip flips and I think baggies and a T-shirt, and we had probably just come from the beach. And we're looking at this place, it had been a bakery. It was supposed to be a bagel shop and something happened with them not being able to get going. And we met the landlord; he's looking at us, and I could totally tell he was like "What, do these kids think they're going to start a brewery here?" He went on a handshake and "All right, this spot's yours. I'll give you a couple of months to get up and get going and we'll go from there." CC: And I think he really didn't think that we'd be able to pull it together. But we did. It took us quite some time; there's a lot of legal things, and that was a huge learning experience, because we didn't hire an attorney, we didn't have the money to hire an attorney to fill out all of our paperwork for the TTB, because we're making a taxable product, for the federal government. CC: So, that's the Tax and Trade Bureau. Because we're turning water into alcohol, there's taxes associated with that with state and federal. GS: And you need TTB approval to brew your own beer, not necessarily to just open a taproom? CC: Correct, this is to brew your beer for sale. Yeah. Because otherwise if you're just buying other people's beer you don't have to go through that. CC: So we had to figure out equipment, building out our new space, working with the city. And this is where some drafting classes I had taken back in high school and in college kind of came in; I drafted our own layout. Went to the building inspector, said "Here's what I want to do; what do I need to do to make this happen?" He worked with me. It was actually a really easy process, working with our city. And they got us up and going and we did a lot of the construction ourself in the build-out. A couple of other things we had to hire out. And we started with two fermentors and a bright tank, and a barrel and a half brewhouse. So we'd have to brew twice, same recipe, to fill a fermentor completely. CC: And we got our federal paperwork filled out, and unfortunately that got submitted a month and a half before the federal government shutdown. So then there was that whole debacle. GS: You got stuck in the federal government shutdown? GS: So when were you planning to open? CC: We were hoping to open in November. GS: And when did the shutdown happen? CC: I believe that was middle of September. GS: So then when did you finally get approval? GS: So you were how far behind? CC: At least two months. Because you know, again like I had said earlier, that beer's one of those things, you don't just show up and tomorrow you have product. So, we didn't want to just open with anyone's product; we wanted to open with our own beer. GS: Yeah so you had to think about, well could we just open the taproom and start brewing later. CC: Yeah. We probably could have done that. My ego had the best of me and I wanted to open with our product, you know. I mean, we do support other breweries. We did at our old location, when we had tap space available, would put guest beers on and kind of cross-promote other breweries, especially close to us. But it was my goal to open with our beer on tap, because that's why people go to breweries, to try their beer. CC: So that was the thing. So yeah we were quite a bit behind, more so than we had projected. You know, we knew there was going to be some downtime. But we finally opened our doors to the public January 11 of 2014. GS: That had to cost you a few pennies. CC: Just a little bit, yeah. GS: I mean did you plan for a slow time? Did you budget for a slow time getting started and did that help eat it up? Or did you have to go out and find some more money and throw it in to get the doors open? GS: And when you say no revenue, based on sales minus the expenses? Or just the ramping up of sales? CC: Just any cash flow. Like, we had zero dollars coming in on a several month basis. GS: Because you're putting the equipment and the build-out and all that other stuff. CC: But then, it was good, because in this part of our town, January through March, it's really busy in the downtown area. CC: You know, the water's cold at the beach. It's seasonal, yeah. So we actually were fortunate that we kind of opened during a strong time, you know, and January was a very strong time for this area. GS: How long were your days back then? GS: So you were bartending too, so you'd come in at three in the morning, brew the beer, and then stay till closing bartending. You didn't hire any other bartenders? CC: No, we didn't have the money at first. We did have two really close friends that helped us out. And one was a PA, and here she is, she goes "It's fun bartending, and I have so much fun talking to people." And I'm like, "You're crazy, you have a really good job." But we were really fortunate that she wanted to do that; she was really good at it. She was really personable and good with people. CC: So we had her. And I mean that was kind of the under-table, like she was just a volunteer at that point. We had another friend that was volunteering and of course my wife, when she wasn't at school or when she started her job, if she wasn't doing that she'd help me bartend on the days when I was just wrecked from brewing all day. CC: So those were really long days, but it was fun; I mean the excitement was there. GS: None of that, now was that, do you attribute that to, you know, a fresh opening in season; did it level off at some point? Or was it the whole way for the first, how long were you there before you moved into the new space? CC: So, we were there up until July of last year. So, we opened January 2014; we left middle of '17. GS: I guess what I'm asking is, did you always have trouble keeping up? CC: Yes. We still continue to have that problem. So it's a good problem to have. All of my problems are good problems: I'm running out of beer, running out of shirts, running out of room. So, all good problems. CC: And the excitement at that point was through the roof. So, expanded into another fermentor and then six months later I mean, still the same problems. I don't ever remember a time of when it was plateauing. And if there was a slow day or night it was a relief. It was like, you know, we could take a break, deep breath, gather our thoughts, try and plan you know. CC: And we were always trying to plan for the next thing, keep things going. GS: That's great. In a relatively small beach town. I mean, this is nowhere near the size of Dayton Beach, which is a half an hour up the road, or Orlando which is 45 minutes or an hour away. GS: So in a small beach town, you were killing it. At what point did you decide you need to move into a new space? Which is where we are now; this is your second location. This is your, not second location; it's your first location expanded basically. CC: Correct, yeah. This is our new home. So let's see, it was the beginning of 2015 we added a fourth fermentor, which completely maxed out our location over there. I mean, we could not possibly fit anything else in that location; we were bursting at the seams. CC: At that point, I started to realize we were losing money. And I say that because there were times, even midweek, when I'd be bartending, all the seats were full, standing room only, and people would like, look in the windows or poke their head around the door and see that it was packed, and they were leaving. CC: So after seeing that for a couple of weeks, so when we first opened there were less than 70 breweries in the whole state of Florida. GS: Were there any breweries in New Smyrna? CC: There were not. No. The closest brewery was Ormand. When we first opened up, it was Ormand, Tomoka, and then Daytona opened after us. CC: We're the second brewery in New Smyrna. We were the first; there's now a second in New Smyrna. GS: There's now a second. CC: They started brewing a month or two ago. GS: They started as a taproom? GS: And then expanded into a brewery. GS: If you had to do it over again would you start as a taproom first? CC: No. No I don't have any regrets the way we started. Well you know what helps us in a sense too, because now there's over 250 breweries in the state of Florida? I feel it's set our roots really deep in the fact that, here's what we intended on doing; we wanted to be a brewery from day one. We didn't see the success of craft beer and then go "Now we should start brewing." So we really, this is who we are. We wanted to be a brewery from day one. So I think, I don't have any regrets on that aspect. CC: But I would say that it was around the beginning or middle of 2015 that I realized that we needed to expand, for two reasons. I saw that we were losing money. We were bursting at the seams. And I knew that the way the craft beer scene was going across the nation and especially in Florida, that someone with a lot of money could come in and crush us. I felt that vulnerable that we were so, so small, that someone could come in and literally make the most beautiful, big brewery in New Smyrna and we'd just wither away, because "Well that spot only has 20 seats, why not go to this bigger spot?" GS: And how much heat does the brewing process create? CC: Over at that old location on the direct-fired system, by nine o'clock in the morning it'd be 110 degrees in there. CC: The a/c didn't even touch it. I stayed really skinny over at that old location. And I remember my wife bringing me Slurpees at 10 in the morning trying to cool me off. But it was a tremendous amount of heat. GS: Did you drink them or where them? CC: Yeah! I chugged them. I mean we had proper ventilation and all that, it's just, we didn't have the cooling capability over there. So that was another thing, is that I was like, this is not sustainable from a worker's standpoint. GS: So you source all of your ingredients locally? CC: As much as possible. There's a lot that we can't get. GS: I mean the grain you can't get. CC: Correct. And right now, we're not purchasing any Florida hops. There are Florida-grown hops now; they're trying to get their strains up and going. So I think later this year we could possibly start brewing with some Florida hops. GS: What kind of ingredients are we talking about that you get locally? GS: Yeah, the citrus industry in Florida is nothing like it used to be. CC: Yeah. And that's all because of some kind of a fungus or something that's attacking them. But ayways we get a lot of citrus grapefruit. Actually a beer we have on tap right now, Michael Tangelo Wheat Ale: our landlord's name's Michael; he has a citrus grove and he gave us a whole bunch of tangelos. So it's a hybrid between the tangerines and oranges, so it's the Michael Tangelo. So I mean, there's not a more direct source of getting your citrus than your landlord dropping off a couple bushels of citrus. GS: You've got to go out and source these things, how do you find, how do you come up with the idea of a brew, I guess. And then source, I mean do you come up with ideas and say okay well I can't really source that locally and you don't do it? Or, what's your creative process? CC: I get inspired by other styles of beer. And then sometimes I'll just be out at a restaurant or out somewhere and I come across something that I want and I'm like "This is really good; I could see putting this in a beer." Or tasting something, putting it in a beer. GS: What are the revenue streams? Let's talk about revenue streams. Besides just selling beer in the taproom, and how much is the taproom a part of your income? CC: So, I would say the taproom is probably about 80-85% of our revenue. GS: And what's the rest of it? CC: Yeah, the rest of it would be our distribution, if you were to break it up like that. I mean we do sell T-shirts and other merchandise: pint glasses, pint koozies and our growlers and what not. GS: So distribution is your number two. GS: And we didn't even talk about that. So distribution, you're selling the beer to restaurants. GS: Interesting. So if that wasn't in place, and that's not in place everywhere. CC: Correct, it's not in place everywhere. GS: If that wasn't in place you would just brew? CC: Yep. That would be my pretty much only choice. And if I wanted to have a taproom, I would have to sell that beer to a distributor and then buy it back. GS: Wow. So if that exemption wasn't in place, you'd brew here, and you wouldn't be able to sell it, what six feet away, from your taps? CC: So that's one thing we can thank Anheuser-Busch for, back when they created that loophole in legislation. GS: But what's the benefit of the distributor model that you can't distribute it yourself and you have to go through a distributor? When you sell to restaurants, you can't sell to a restaurant direct? CC: Correct. The theory on the three-tier system is it's supposed to help regulate alcohol sales. GS: So an Anheuser-Busch or somebody can't dominate as much, it gives an opportunity to the smaller breweries? GS: So you weren't able to keep up between your own demand from your taproom and then the demand from distributors. So have you thought about how to expand on the distribution side? GS: But you've got to market it somehow. GS: Right now you're relying on the distributors to market it and get it in places. You're not doing too much of an effort to expand your brand in distribution. So, have you thought about that? CC: If we were to make a big leap and make the distribution side be a bigger part of our business, I would have to invest in a sales guy or some other kind of marketing. But right now, and this is what's crazy, in New Smyrna Beach, I think our last census was 22,000 full-time residents, I remember, within city limits. And there's 150 restaurants in New Smyrna Beach. GS: 150, just in New Smyrna Beach. CC: 150 restaurants in New Smyrna Beach. So, we're in I think, 13 of them. And we can't keep up. GS: I don't know about you but I always go to like, the same four. CC: Yeah, me too, me too! GS: And they're probably the same four. GS: Oh there is. Okay, so you could sell more today. CC: We could sell more if I could make more. Another great problem to have. GS: Just add a few more tanks. CC: Yeah. I also like the fact, and it kind of works in our advantage right now, that we are the highest price draft beer right around us right now. And the fact that you can't always get it kind of keeps people wanting it. GS: Creates a little more demand, right, right. How do you price a beer? Is it just a percentage markup of what your costs are. But your costs are going to tank. GS: Your Shark Attack IPA's a pretty high alcohol. CC: It's extremely high, 7.4%. GS: What is a normal beer? CC: Well if you, define normal. GS: I don't know. Budweiser. GS: So Budweiser's 4.2% alcohol; Shark Attack IPA is 7.4. That's a big difference. CC: And our barley wine's 10.1%. CC: It's also why we serve it in a smaller glass, yeah. GS: You only need one! CC: One and you'll be, it's a dessert beer that's for sure. GS: Let's transition to everybody's favorite topic, money. So, what does it cost to open your own small scale brewery? CC: I feel like I kind of did something that's now impossible. Just because of the timing, when the craft beer scene wasn't as big as it was, and I feel like New Smyrna grew with us, and helped us grow. I don't think I could repeat what I did now, by anymeans. I don't think it's possible. GS: Certification from the state and all that stuff. CC: Now I know people can say well you can do it with less; I did. But I feel like if you're going to have a chance, at how competitive the brewery scene is nationally and in Florida right now, you'd need at least $500,000 to get up and get going. GS: And then it took you four years to be able to get a salary out of it. GS: So that's $500,000 you're putting in; that doesn't guarantee that you're getting a salary out. GS: Are you guys able to start stockpiling cash now, and take money out? GS: And we're now in February of '18. CC: February, yeah. So we're just getting going here, recovering our investment. I have the mentality of paying things off sooner than later; I don't want to go full term on our bank loan. Especially when you look at what you'd pay interest-wise. GS: It helps with cash flow though. CC: Yeah it does, but I'm at a comfortable place right now. I don't see an expansion in the near future. We don't have any major equipment purchases coming up. I'm trying to pay myself a decent amount, pay down our bank loan, and then we'll be able to start taking some cash out. I'm not going to be pulling up in Rolls-Royce next week, that's for sure. GS: You going to go back and buy all those toys back again? GS: Right. So that's the other thing, is your wife is still working full-time. GS: Do you see a point at which she doesn't have to work full-time and the two of you are working in the business? GS: But she helps around the business though? CC: She does. She manages me. GS: And that's a full-time job right there! CC: A full-time job, making sure I'm here making good beer. She has an important role in quality control. She has a very good palate, and her sensory is very acute. She picks up a lot of stuff, a lot. So she helps me. GS: Does your palate, has it changed over time? I wonder if by tasting beer so much you get a little too used to it? CC: Yes. And my tastes in beer have changed. And also there are certain styles of beer that I don't care for at all. But she does. GS: And so she can sort of offer you that. CC: Yeah. So she does that. And then she does all of the bookkeeping. She's really on top of doing all the QuickBooks, making sure that we're profitable, that we're where we need to be financially. That's a huge role. GS: So, a lot of people think that, "Hey you know, I can pour from a tap; I can talk to people. I like drinking beer. Why don't I open a taproom? Why don't I start brewing beer?" CC: Anyone could. Anyone could. I did. I'm a prime example. I have never worked in a restaurant or bartended. GS: So you had no experience in the service business? GS: You guys are borderline crazy then. CC: Yeah definitely. I mean, anywhere you go, if you pay attention to what's going on in your environment, you can dissect if you're getting good service, poor service. So I knew when we started that we had to have first of all, a really good product. And I knew we had to have phenomenal customer experience, and service. So I feel like, I've been to a lot of places that have phenomenal beer, and the service was horrible. And you know what I remember? The horrible service, not the good beer. CC: So I knew that if we could cover those three things, I knew we had a shot at making it. GS: So you're still doing all the brewing yourself. GS: Are you still bartending? CC: No. Only in like, if everyone's trying to do a vacation on the same day or same weekend or something happens. It's extremely rare now that I'm bartending. GS: Are you the only brewer in-house? GS: So happens if you go surfing and break an arm? Can you break an arm surfing? I think that's the first question. CC: Yeah. Yeah, yeah. I'm sure it's possible. GS: What happens if you go surfing and you get bit by a shark. Because it is the shark attack capital of the world. CC: So that's where we're going to test my communication ability in telling someone else how to do something! And watching over them. GS: That's a big risk that a lot of entrepreneurs have to take. CC: Long term yes. Also, quality of life. I mean I've worked extremely hard to get to where I am now. I do truly enjoy what I'm doing, but I know that there will be a point of burnout. And I think, we will in the next year or two have to transition in someone to either be an assistant brewer, or a full-time brewer and I just get to dabble and have some fun. GS: Is that the dream? CC: I mean, this is the dream. Brewing beer. I work for myself. I don't think I'll do this for the next 25 years until retirement. I think something new will intrigue me. GS: What might that be? GS: I want to go back to something you just said. Working seven days a week, living the dream. How is working seven days a week; 10, 15 hours a day; tell me about that. That's living the dream? CC: Yeah well let me change that. So, that's what I used to do up until about seven months ago. I'm still, I'm here at least five days a week doing the long days. But it's not work. Let's change that. I'm tired at the end of the day, but I love what I do and I know a lot of people that don't love what they do. CC: And so I feel like it is living the dream, because where we are now, I actually didn't think we'd reach this success level. I've had a lot of jobs where it's been construction oriented, like I manufactured surfboards for 10 years, so I was always intrigued with the whole, how things get to the finished product. And that's how I got started with brewing beer; I was simply curious about the process and if I could make an actual, really a good drinking product. It was a hobby that spiraled out of control, and it turned into an obsession. And it still is an obsession. GS: It's still an obsession? GS: Do you consider yourself more a brewer, taproom owner, or an entrepreneur? GS: That was pretty easy. GS: Why'd you answer so quick? GS: Would it result in more money? CC: Maybe not. It could, it could. GS: I mean, nobody's complaining about what you make now. CC: No, no; we don't have any complaints. But I think I could also hire someone to do a better job at running the business and I can really sit back and kind of really figure out where we could save money and make money. And there's why there are people that are out there who train to do one thing and be really good at it. So, I'm definitely an entrepreneur; I saw a niche, had a dream, made it happen.